In 1997, my family took a road trip from Ohio to North Carolina to visit my mother-in-law. The twelve-hour, two-day trip was a wonderful time to sing, laugh, and enjoy time with our two young daughters and our black Labrador retriever, Ebony. On day two, as we traveled east on Interstate 40 near Raleigh, preoccupied with the needs of the kids and the dog, we forgot to stop for gasoline. The engine stalled in our rather large Buick station wagon and we ran completely out of gas. Luckily, my brave wife, Bonnie, who was driving, was able to coast down an exit ramp and bring the car to rest directly next to a gas pump at a filling station. Thankfully, we were able to avoid disaster and our experience became an unforgettable family story. But it also serves as valuable lesson about the importance of paying attention to things you must have that can expire – like metering rods. The good news is, there’s an important element of some metering rods that can help you track rod life and be prepared for when it’s time to change rods: The serial number. Accountability – A unique identifier allows for accountability from the manufacturer through the end of life of the rods and holders. Buschman metering rods and holders are high precision instruments, which are manufactured with extreme care and include a comprehensive quality control system. Our personal accountability is built into every rod and holder, which is precisely why our customer can coat with confidence. Tracking – Part serialization allows customers to track cost-effective statistics such as rod life and quality throughout the cycle of the production history. Customers can enter and track the serial numbers into their production processes and using statistical process control or other disciplines, understand and, yes, pre-determine how long rods last. The customer can use a rod multiple times and know exactly how many meters of material have been run and most importantly, pull the rod from production BEFORE the coat weights deplete below acceptable specifications.It’s like having your own metering rod “gas gauge.” For example: Suppose a customer has determined that Buschman rods last 200,000 linear meters. Using serial number tracking, the production people know the rod they’re using has 180,000 linear meters on it, so they can plan to pull the rod after an additional 20,000 linear meters and replace it with a new rod. Production managers and superintendents have explained to me on countless occasions that this simple act saves them multiple times more value than the cost of the rod and holder combined, because the loss in quality of the coating is much more costly than the cost of the rod. Maximize Life – Suppose a coater runs multiple web widths while producing short runs. A used metering rod can be cleaned, dried, and used again for the same or narrower web widths. As one operator put it, “we can always go down in width but never back up” on a used rod, as the wear in the middle section of the rod will be more than the wear used on the ends of the rod. Serial numbers are located on the ends of Buschman rods. The information includes our name as the manufacturer, the thread profile and size, and a unique serial number, as shown below. Production job number: This is the batch number under which the rod was manufactured. On any given customer order, all rods of the same part number will be marked with the same job number. Operators do a great job of understanding the coating equipment, following protocols, and running coating operations day to day. However, setting up a quality system that comprehensively tracks quality in relation to rod life should be the responsibility of every manager, process engineer, superintendent, or assistant superintendent in a coating operation. Tribal knowledge can be useful, but having a written, comprehensive procedure is always best for uniform practices across multiple shifts and production groups. This enables you to create and set policy for the life of the rods and when rods will be pulled and disposed of. One final piece of advice: Worn rods laying around have a tendency to find their way back into production. It’s like burying a tire; sooner or later it will rise to the surface. Always cut rods in half and be sure to remove the rods from the premises. The quality of your coating operation depends on it! 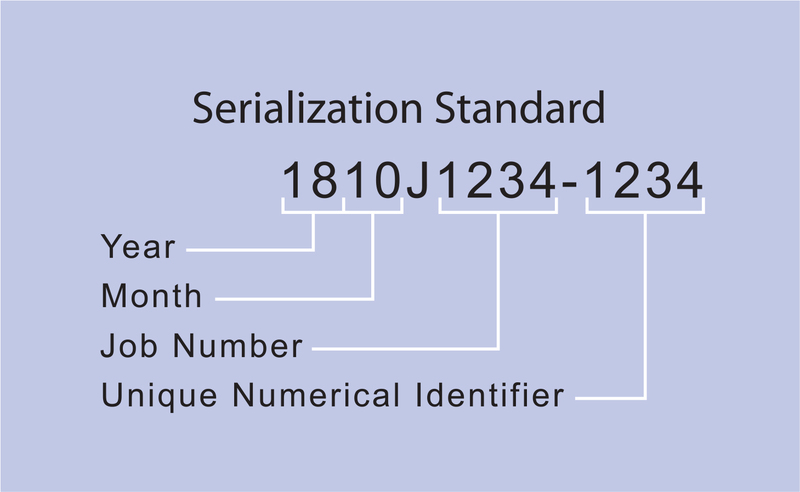 For an easy to print pdf, please email sales@buschman.com and request “Why We Serialize” data sheet.